A sweet fortified wine, 'invented' in 1773 by English merchant John Woodhouse who found that the local wine aged in oak barrels reminded him sherry and madeira. Similarly fortified with brandy, Woodhouse suspected it would tickle British taste buds and could be safely exported by sea to the far ends of the British Empire. Bingo. It was a huge success. He was followed by another pioneer, Benjamin Ingham, who founded Ingham Whitaker & Co in 1812. In the 1830s, Woodhouse's firm was purchased by Vincenzo Florio, and in itne 1920s the whole lot was bought by Cinzano. Still known as Florio, it remains one of the two big Marsala producers, along with Pellegrino. Along with Sicily's other wines, it's currently making something of a comeback after decades of being thought of only as a wine cooks swill in the kitchen, especially since the once groovy chicken marsala has gone the way of prawn cocktails and grilled grapefruit. Marsala comes in three different colours. Oro (gold) and Ambra (amber) Marsala are made with white Grillo, Inzolia, and Catarratto grapes (cooked grape must, mosto cotto gives Amber Marsala its colour. The third, Rubino (ruby) is made with Perricone, Calabrese, Nero d'Avola and Nerello Mascalese. There are also three levels of sweetness: secco (dry) semisecco (semi dry) and dolce (sweet). You might also find Mistella, a sweet fortified table wine made from Grillo grapes, or a nectar-like Vino Liquoroso made from zibibbo grapes. 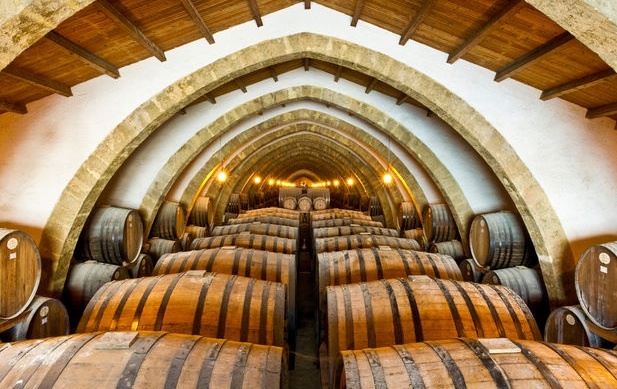 Marsala is one of the few wines that requires oxidation so the red oak barrels are never filled to the top. Bottles labelled fino (aged one year) and superiore (aged two years) are designed for cooking: the dry is essential for that old Italian favourite scaloppine alla Marsala, to caramelize meats and deglaze savoury sauces, while the sweet goes in many desserts, especially zabaglione. Drinking Marsalas are aged longer: Superiore Riserva for four years, Soleras or Vergine for at least five years; Vergine Stravecchio or Riserva for at least ten years. A top range Marsala will still be good after a hundred years. Marsala, as they like to say, can start a meal as a chilled aperitif (it's good with spicy olives) and end a meal with strong cheeses such as Parmigiana(stravecchio) and dessert. Aficionados like to pair it with 'difficult' flavours such as asparagus, brussel sprouts and chocolate. Old dry Marsalas are good with spicy dishes.